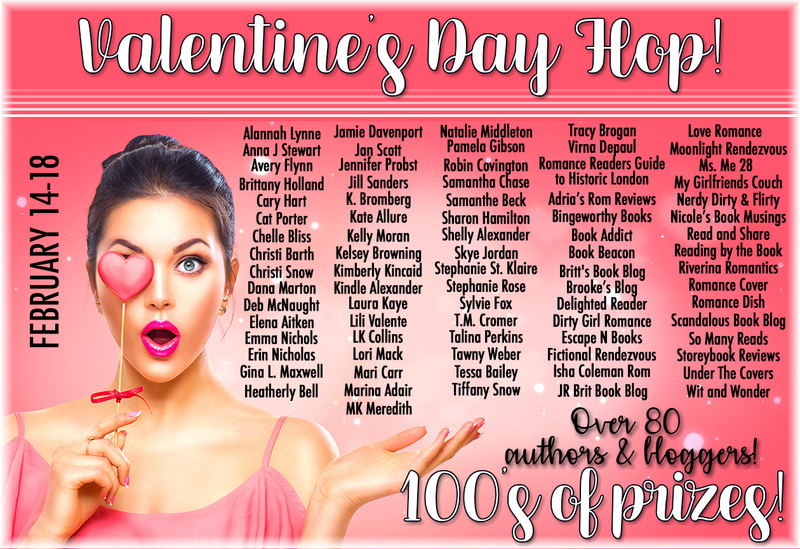 Join us on Facebook today for the Valentine's Day Hop! Facebook pages for Valentine's fun and giveaways. I'll be giving away a $20 Amazon e-gift card! If you aren't on Facebook, don't worry. How do you plan to spend Valentine's Day? What's your favorite Valentine's treat? and kept a few for myself. So good! will receive a box of books from my book stash. Favorite treat is any dark chocolate mocha type truffle. We usually go out to eat for V Day, not necessarily on the day itself and sometimes restaurants can be crowded and prices can be hiked up. I am current reading The Dangerous Billionaire by Jackie Ashenden - I recently finished The Wicked Billionaire; am enjoying this series. Believe there is one left in it. Thanks for the giveaway. I always love to receive a mystery pkg of books. I love dark chocolate. My husband and I exchange gifts, I made a nice dinner yesterday because he works until 11 PM today. Happy Valentine's Day! Happy Valentine's Day, PJ! We plan to spend the day quietly due to my recent surgery. We are grilling steaks, and I have a lovely bouquet of roses. Chocolate is a favorite treat. I just finished a sweet and funny book. Have you read THE ROYAL TREATMENT by Melanie Summers? Hope you're continuing to heal well, cheryl. I have not read The Royal Treatment. Thanks for mentioning it! Happy Valentine's Day! My husband is on an extended business trip, I will be with my mother-in-law. I don't know that I have a favorite treat for the holiday, generally something with chocolate is always wonderful. Will be baking up some chocolate chip cookies, and hope having a few, warm from the oven, will make my mother-in-law smile. Forgot to mention that I am reading Jo Goodman's A Touch of Frost and am so enjoying it. Warm from the oven chocolate chip cookies are a pretty awesome way to celebrate. I'm a Jo Goodman fan from way back. I'm making a romantic dinner by candlelight for the hubs tonight including chocolate covered strawberries and wine! I just got done with the entire Maiden Lane series by Elizabeth Hoyt. They were all SO GOOD!!!! I loved the Maiden Lane series. Can't wait to see what she brings us next! I love red velvet cupcakes for Valentine's Day. I will make some later. I am currently reading Furiously Happy for s reading challenge, but think I will pick something to re-read for Valentine's tonight. Probably Lisa Kleypas'. We usually spend Valentine's Day at home and husband cooks my fave dishes then we stay up late watching a movie. We aren't really big on Vday gifts but we exchanged one this year! I'm currently listening to How to Date Your Dragon by Molly Harper and it's good so far! I look forward to enjoying precious time with my husband and I will create a delightful supper. I enjoy chocolate mousse. I appreciate everyday with my husband which is rare since he works so hard. Tonight will be a relaxing evening as I will prepare a lovely dinner. Chocolate gelato is always a treat. I agree! Chocolate gelato definitely is a treat! I've been hearing lots of good things about Penny Reid lately. I think I need to give her books a try. We don't really celebrate Valentine's Day, but I love dark chocolate. And I am currently reading an ARC of Devil in Tartan by Julia London. I really enjoyed Devil in Tartan! I am spending the day with my hubby. He is making jambalaya for dinner tonight. I made brownies and bought vanilla ice cream. We are going to watch the Olympics. I am currently reading Abandoned by Mary Martinez. My favorite treat are Fannie May's Pixies. I'm not familiar with Fannie May Pixies. Off to investigate! Im reading Rough Ride by Kristen Ashley. We are doing family Valentine's dinner at a local restaurant. Then my hubby and I are going to a hockey game this weekend. How's the book? I have an ARC but haven't read it yet. Just spent a quiet day at home. Finished reading Susan Mallery's Maricelli Bride - really enjoying this series from over 10 years ago. I love dark chocolate - either solid or maybe with a cherry or some coconut inside. I’m currently reading (and enjoying) Lisa Gardner’s Look for Me. Since today is Ash Wednesday—no treats for me! If I had had them, they would undoubtedly have been chocolate. I spent a fair amount of the day gardening, and it was a nice day for it. Thanks for the giveaway. Happy Valentine’s Day. Boohoo was post disappeared. I like any kind of dk chocolate truffles with an mocha/espresso type filling. Thanks for the contest. Happy Valentines Day to all. Hope this post sticks. LOL. I love any dark chocolate truffles with a mocha/cappuccino filling. Don't know why my posts are not showing up. Looks like this post may have gone thru. Am reading Close Contact by Lori Foster. 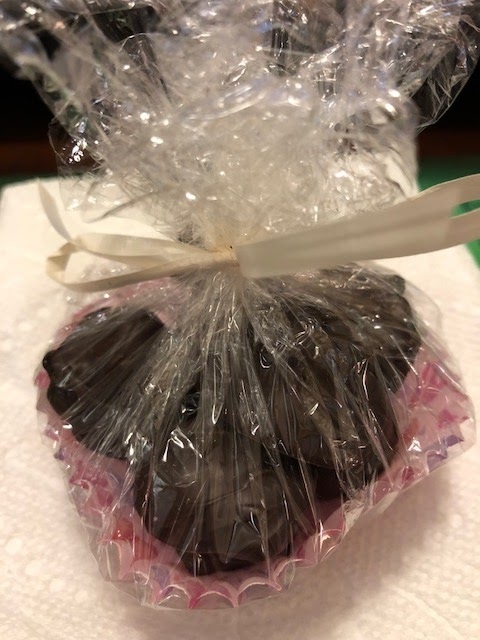 Your favorite - soft caramels covered in dark chocolate and sprinkled with sea salt are a favorite of mine. I get them in jars at SAM's or Aldi's. Have a jar of them now. This year I spent the day on bed rest. I am misbehaving now being on the computer. Had a medical procedure yesterday. My husband fixed a nice dinner of shrimp and lobster tails. Sadly no wine this year. Patricia Barraclough Having trouble with my google sign in again. I love chocolate covered cashews. And would love to win the books from your stash.